← Gen 3:21 God Clothes Them With Coats of Skin! Gen 3:15 The Seed of the Woman! The Seed of the Serpent! We can see that there are far fewer verbs given than there are nouns. Let’s start with the verse’s first verb “put”. We can clearly see that this is something that God says He will do. This word has a meaning “to place”. For example, you can “put” something on a shelf. You can “put” something in the refrigerator. But this verse says God will put something between two other direct nouns. The implication is given that God will change the order of something from one thing to another. You could say a reversal of roles, for example? You could also say this is a division or a separation of one noun from the other noun being separated with something in between. You might see this more clearly if you read my other blogs. What we need to do at this point is see who God is talking to and then to see what was placed between them to cause this separation. What we discover is a basic principle of the nature of seeds. A seed is something that when planted produces something else. But it only produces, based upon the law of Genesis “after his kind“. In other words apple seeds produce apple trees and not orange trees. Now here is the really important part of the verse, it says that the “seed is in itself”. In other words you cannot separate the seed from the tree or the fruit; they are considered to be one. An apple tree will produce apples, that have seeds that when planted will cause there to be more apple trees that produce more apples, that have more seeds that go on and on. These are the basic Bible laws surrounding seeds. If you do not understand them you can go read my blog series on “Understanding Seeds”. 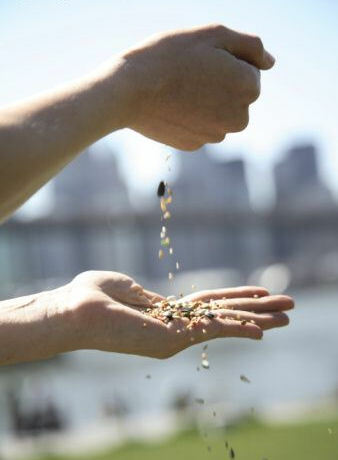 The principles of seeds are quite simple but the implications are vast and complex. If Genesis 3:15 is talking about the seed of the serpent, you have to go back to Genesis 1 and apply the seed law principles and see that they are considered to be one in the same. The seed of the serpent is in himself. The serpent is representative of a spiritual tree that has fruit with seeds in it. These seeds can be planted and will cause to multiply and grow and become greater in number. Yet this multiplication system still demands that no matter how many that are produced from it, they all originated from the one. If you have never studied the Bible on the subject of “seed” you should because it is a wealth of information. Most everything that God does is based upon a seed principle. Jesus told us a parable of a man sowing seeds and said if you don’t understand this one you will not understand any other. Hopefully you understand the principle of seeds a little bit better now. Levi is said to have paid tithes because his great grandfather paid tithes to Melchisedec. Levi a future descendant was in Abraham and therefore whatever Abraham did, Levi did. That is one of the most important things that you can learn from our lesson today and it is certainly indirectly related to our primary subject of who the seed of the woman and the seed of the serpent is in Genesis 3:15. So let’s approach the subject of the seed of the woman as being Jesus Christ but, from a different perspective. If the seed of the woman is Jesus Christ then who is the seed of the serpent? We know the serpent is Satan, but who is the seed of the serpent? You see you cannot say one type of seed is an individual male child without saying the other is also an individual male child. You must be consistent in your interpretations and not try to make one noun a specific object type and then try to change the definition of the other identical noun to make it to be something else entirely new, do you get it? So if Jesus Christ is the seed of the woman in Genesis 3:15 as many preachers have said, then who can the seed of the serpent be? I do hope you see the logic behind that question. What the Bible says matters, every word and every detail matters and then how you interpret the Bible also matters. If you are not being consistent and treating every word the same, then you are being selective in what you teach and therefore getting it wrong by default. So pay very close attention to every detail; then ask questions. When you read across a detail that you do not understand, start to formulate questions and make notes on them. You never know when you will be reading a verse in the Bible and suddenly realize that you just read the answer to your question you had a few days or weeks ago. So I hope you can see logically that the seed of the woman cannot be Jesus Christ, because we have not named the “seed of the serpent”. Here is another difficulty that I have with saying that Jesus is the seed of the woman, I have not found any verses in the Bible that says that Jesus bruised the head of the serpent. Can you find one? What I discovered in studying the Bible, is that it says Jesus sat down at the right hand of God waiting for His enemies to be made His footstool (Hebrews 10:13). What we learn from this one verse is that Satan (God’s enemy) is not yet completely under the feet of Jesus. Do you get it? So what is God waiting for? So let me ask you again who is the seed of the serpent? Is this Satan’s physical child? I don’t think so. But you have to be consistent, if one seed is a man child you have to make the other seed the same. This is just a basic law of correct Bible interpretation, be consistent and apply what you do equally across the board to each occurrence of the word. If a word occurs twice in one verse interpret them equally. Getting back to the problem with this KJV translation of Genesis 3:15 I alluded to the fact that two nouns “it” and “his” were mistranslated because some translators thought they were speaking about Jesus Christ and this idea crept into the translation. The word “it” in this verse is a Hebrew feminine word that is actually translated as “her” or “she” many times in the Bible. You can see that in Genesis 3:12 when Adam says “the woman that you gave me, SHE gave me of the tree”. This “SHE” is the same Hebrew word, so SHE is a valid translation for this word. Search your Bible and see it for yourself. Then the term “his heel” does not have an actual Hebrew word associated with it that tells you the actual gender of the owner of the heel. In other words “her heel” would work for this verse equally as well and I believe it could be a much better translation. It totally depends on whose heel we are talking about doesn’t it? Look at your Bible and see if these are true. Is there a Hebrew word for “his” that has a Strong’s definition? I couldn’t find one! So I am convinced based upon other scriptures in the Bible which I haven’t given you here that this verse in Genesis 3:15 should end like this: “she shall bruise thy head, and thou shalt bruise her heel“. If you need more scriptures I’ll give you a quick synopsis of more evidence from the Bible of who this woman is. In Luke 10:19 Jesus told his church “I give you power to tread upon serpents…“. Reading that verse you have all of the key elements and nouns repeated from Genesis 3:15. You have a woman, who is the church, you have the mention of the serpent who is Satan, and you then have the action verb of stepping on the serpent with your feet. This is just the exact same stuff that we read in Gen 3:15, using different words. I hope you can see it. Then there is another verse that is very critical to understand found in Romans 16:20, “The God of peace shall bruise Satan under your feet shortly…“. Again we have a verse of scripture written to a woman (the Church) whose feet are to be used by God to bruise the head of Satan (the serpent).” You see, these two verses alone tell me that Jesus Christ did not accomplish this already and they confirm to me who is directly prophesied by God to complete this bruising of the serpent’s head. The Church is a spiritual woman, in covenant with Jesus Christ. Here is another perspective to consider, the church is called the “Body of Christ”. Jesus Christ is said to be the Head and the church is said to be His body (Eph 5). Where exactly are the feet located? Are your feet located on your head or on your body? So if God is going to use anyone to bruise the head of the serpent, would He not use His body? It’s not rocket science you just have to read and see what it says. I have already blogged on most of the rest of this information when I gave you information about the woman in Revelation 12. Maybe I should rehash it again so that you can see it more clearly. You see the Bible in Revelation 12 speaks about a woman and since we are talking about a woman in Genesis 3:15 we should approach this woman as a potential candidate for the prophecy that God has given to us. You do not know it is not this woman do you? What I found absolutely fascinating was all of the clues given to us in Revelation 12 that fit the pattern of the prophecy in Genesis 3:15. First God is talking to the serpent when He prophecies in Gen 3. God actually reveals to us the true identity of the serpent in Revelation 12:9. Knowing this fact alone should give you some clues that God is revealing something that is much bigger in that Genesis 3 and Revelation 12 are related. You should be able to see that Genesis 3 and Revelation 12 are closely related if you study both chapters very closely. In Revelation 12 we have two primary nouns being repeated. These two nouns are the woman and Satan (the ancient serpent). The dragon we are told in Revelation 12:9 is definitely the “old serpent” so we can now see that the woman certainly could be the same woman being prophesied about in Gen 3. Now skip down to the last verse in Revelation 12 and notice another direct mention that is certainly not a coincidence. So now we have some information that the dragon hates the woman. The dragon is said to be at war with the woman and that makes him and her enemies. What did God say in Genesis 3:15? God said that he would put “enmity” between you (the serpent) and the woman. Again we see some amazing parallels being spoken of. Then here is the real kicker, did you notice that verse in Revelation 12 spoke of the “seed of the woman” again? Satan was at war with the woman’s seed. Do you understand that statement? It certainly sounds like this is the prophesied woman in Genesis 3:15. If you do not understand how the heel and the head of the serpent come into play you need to stop here and go and read my blog on “The True Identity of the Woman in Revelation 12“. Once you realize that the woman in Revelation 12 is standing on the moon with her feet you will begin to understand this is the woman that God spoke of way back in the beginning. I know this is different than anything you have ever heard before, but yet if you can read with your eyes open you will see that it is all true. I pray that this has been a blessing to you and that you will pass it along to someone who can learn from it also. God Bless. If you would like to continue to read in this series concerning the spiritual subjects hidden in Genesis 3 please go to “Part 10“. Posted on January 23, 2010, in Bible Study, Chapter 3, Genesis and tagged Bible, Christianity, Church, creation, Genesis, God, Interpretation, Jesus, Prophecy, Religion, Revelation, Satan, seeds, Truth, understanding. Bookmark the permalink. 14 Comments. It has given me a better understanding to that scripture. Thank you. Thank you for the kind comment. God Bless you. Thanks, for sharing. Great information. Thank you so very much for your time and your comment. God Bless you. I’m looking at the big picture of what is going on, but I am also trying to see what the end result is, and why God is waiting for a remnant of people to reach maturity over satin and have maturity over the work’s of God’s kingdom. I completely understand and believe what you are saying and have believed the same thing, so this is really a confirmation of where God wants us to be. What is the results that God is looking for? And why is it important for God to be waiting on this remnant? Is it somehow connected to the great revival God said would take place before He came back? Thank you for reading and studying the Bible here. I appreciate your comments and questions. I do believe the church will go out victorious over Satan. I also believe a revival will take place based upon Romans 5:20 where God says that when sin abounds Grace does much more abound. God Bless. Very interesting read. Well thought out and delivered. I do feel a bit left hanging about something, though. Maybe I just missed it,… But who is the seed of satan, or at least, who would you say it is? If not a who, then what? Thanks man. Looking forward to hearing back from you. You are very kind, I thank you for your time in reading and making a comment. You are truly a blessing to the body of Christ. Great stuff! It is amazing how much one can learn if pride and arrogance are place aside. One question I have though, can the “his” in Gen 3:15 be considered to be collective and in this case be replaced by a ” their”? In some dialects and language the male nouns and pronouns represent a plural. That is a very excellent question, you are obviously a deep thinker. The Hebrew word H1931 is clearly a feminine word by definition from the Strong’s, but it is translated in many ways as personal pronous like he, she or it. The only way that I could see how to translate it correctly was based upon the context usage of the word. 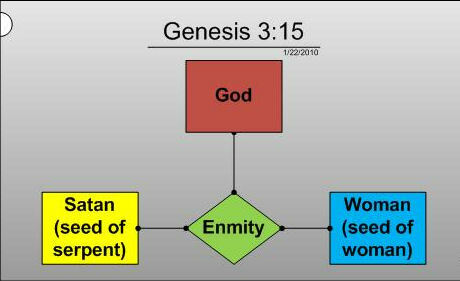 In Genesis 3:15 the primary noun subject was the woman so I associated the correct translation to the woman as being “she”. However scriptures like Exo 1:10 the Hebrew word H1931 was translated as “they” which also appears correct within the context. The Bible is much more complex than this, since God calls the natural nation of Israel His wife and a woman repeatedly. The church is also called a woman and a bride and it is comprosied of natural males and females like the nation of Israel was. Therefore the feminine application for the nation of Israel is still very viable and the translators could have translated H1931 as her instead of they and it would have been correct from God’s point of view. Any way thanks for your question, if you have any thoughts or insight on this subject you are free to leave them in response. God Bless!